Pictured: Dr. Lee, Mele Look and Dr. Lew, editors of new books. Faculty at the University of Hawai’i (UH) John A. Burns School of Medicine (JABSOM) contribute to new books as part of their scholarly endeavors. This “Booknotes” Section of UH Med Now features some of the most recent work. Mauli means life, heart, spirit, our essential nature. Ola means well-being, healthy. 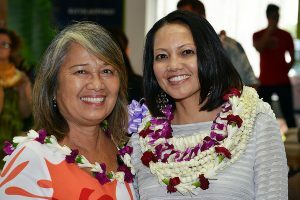 Mele Look and Dr. Winona Lee at a book launch event. This volume, the fifth in the Hawai’inuiākea series is dedicated to pioneer, Dr. Richard Kekuni Blaisdell, founding Chair of the Department of Medicine at the University of Hawaiʻi John A. Burns School of Medicine (JABSOM) and mentor to several generations of doctors. Included in the book are archival interviews from Dr. Blaisdell. Over 30 contributors come from the Department of Native Hawaiian Health at JABSOM. The Department of Native Hawaiian Health is the only clinical department in a United States medical school dedicated to the health of an indigenous population. These contributors tell their own experiences and stories about how and why they became doctors. Many doctors had teachers and mentors who helped them along the way and the reader gets insight into them. Historical significance of Kalaupapa, Molokaʻi, the Hansen’s disease settlement and how the ancient form of hula can help prevent and serve as a treatment of heart disease are also included in the book. There are also informative historical health statistics on The Kanaka Oiwi, which had a population in size of 683,000 in 1778. That population declined by 95% by the late 1800s due to infectious diseases introduced by European settlers. But that population is rebounding as the Kanaka Oiwi is expected to double in size from currently 298,000 to 512,000 by the year 2045. Kānaka ʻŌiwi is a term used to describe Native Hawaiians. An ʻŌiwi is a person who has a genealogical relationship to Hawaiʻi. Hāloa is an ancestor that connects all ʻŌiwi to Hawaiʻi. ʻŌiwi have similar origins, stories, language, practices, and beliefs, which are founded in the Hawaiian Archipelago. Native Hawaiians are ʻŌiwi. Another term for Native Hawaiian is Kānaka Maoli. 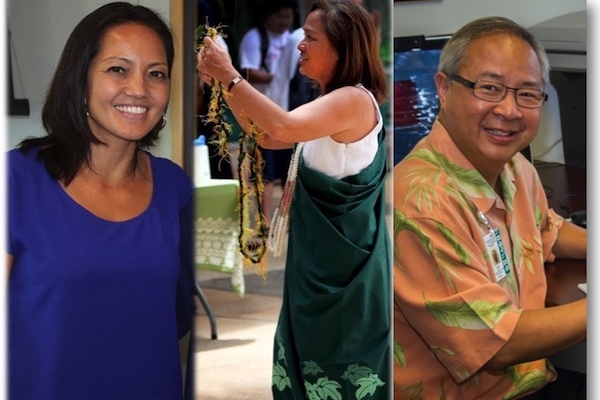 Though each contributor has different stories to tell they all have the same common goal of helping to improve the life of Native Hawaiians and Pacific Islanders. The book is edited by UH JABSOM Department of Native Hawaiian Health faculty members Winona K. Mesiona Lee, MD, director of the Medical Education Division and Mele A. Look, director of community engagement at the Center for Native and Pacific Health Disparities Research (P20). 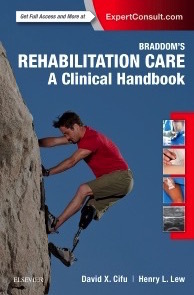 Braddom’s Rehabilitation Care: A Clinical Handbook can be viewed as an e-book online or in a standard print version. “Rehabilitation care is for all ages, as it is an important key to restoring a person’s function and quality of life,” says Dr. Henry Lew, co-editor of the book with Dr. David Cifu. Braddom’s Rehabilitation Care: A Clinical Handbook is a comprehensive and practical source of information for medical doctors, medical students, physical therapists, occupational therapists, and speech-language pathologists. This book offers a concise look into different ways of rehabilitation care, and each chapter comes with 15 slides and “clinical pearls”, which Dr. Henry Lew says teachers can use to quiz their students. More than 50 professionals in physical medicine and rehabilitation (PM&R) from around the world contributed to the book. Some topics include examination and treatment of pediatric and geriatric patients, neck and back pain, osteoporosis, sports medicine, myopathy, multiple sclerosis, traumatic brain injury, and spinal cord injury. The two editors, David X. Cifu, MD and Henry L. Lew, MD, PhD are international leaders in the field of PM&R. This is their third textbook together. Dr. Lew is chair of the Department of Communication Sciences and Disorders at the John A. Burns School of Medicine (JABSOM). He sees patients with traumatic brain injury at the Gold Bond Building (677 Ala Moana Blvd. ), and has clinical privileges at The Queen’s Medical Center. 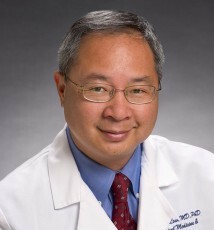 Throughout his clinical and research career, Lew has published more than 130 scientific articles and 4 textbooks, “It is the best way to disseminate information and promote evidence-based practice in medicine,” said Lew. The book, already well received by PM&R colleagues in Europe and Asia, will also be translated into Chinese. Dr. Lew is currently working on his fifth textbook, which will be on Geriatric Rehabilitation, for which there is a growing need.